Strange Small Stuff. : Why are there no tailed Eukaryote Viruses? Why are there no tailed Eukaryote Viruses? I would love to say that i heard this question many times already, however i didnt. Since i didnt study at university and all Knowledge about Biology i have i aquired through Study in my own free time for a little more then a year now. So i dont have any oppertunity to to actually talk with others who are interested in the same things, and those who are seem to be kinda smug to lay people. But still its a valid question that i hope every undergrad can answer. As we know there are 3 Different Domains of life, but for simplicity i throw archaea in the same pot with bacteria since both dont have a Nucleus. So what do i mean with Tailed Viruses? I find those Viruses very interesting, i guess its because of their out of world like appearance Archaea have tailed viruses aswell so why dont Eukaryotes have tailed viruses too? Well its pretty simple if we look at what caudovirales are and what they do. They are class 2 dsDNA viruses. They attach to a host and then inject their genome right into the host. As far as i know its the naked DNA that gets inserted. There are no viral proteins known (to me) which may be attached to the DNA. Thats it. This works very well for bacteria and archaea since they dont have a nucleus. The DNA that gets in is readily transcribable and doesnt have to face many obstacles except CRISPR based defenses. cell wall thickness doesnt play a large role in this since the thickness of Eukaryotic, archaea and bacterial (except plantcells) cells is similar and should not be an obstacle that viruses cant outevolve. Its the nucleus in my opinion that makes tailed Viruses unlikely to happen for eukaryotes. 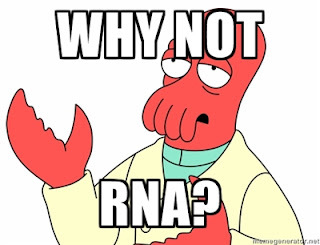 Naked DNA in the Cytoplasm is quite useless and doesnt do jack. It must get to the nucleus but how can it? It has no protein that might help it get to there. RNA is notorious for making errors and a tailed Virus is something that really doesnt need errors. Most Tailed viruses have large genomes and most of those are Structural genes that are responsible for the Virion. 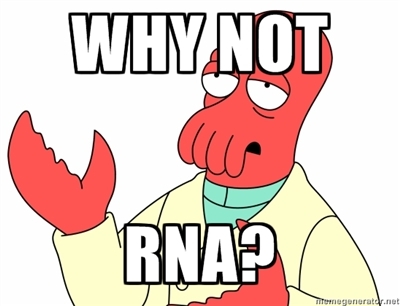 Also there seems to be somewhat of a limit in size in RNA viruses. Meaning, its double unlikely. Reoviruses are to date the largest RNA viruses if we count total nucleotides present still its genome is all segmented. And in total can reach around 30 - 40 kbp which seems to be enough but infact isnt since segmented viruses mutate quickly and would loose the tail very quickly. So that is essentially it. There are of course other factors but the most importend one seems to be the nucleus of eukaryotes protect against tailed viruses very well. Since tailed viruses seem to be a majority in the world its very very likely that eukaryotes evolved because they cannot be infected by the normal viruses and had at the time an extreme advantage over Prokaryotes. Which means that they could evolve and multiply for maybe millions of years without much selectionpressure. While bacteria where hunted down. So in this way the tailed phages directly are responsible for our creation. Which could mean that the pictures above are the face or at least hands of God. that should cover it i reckon. If you find errors in my errorprone little essay please point them out (without being smug...) and i edit the parts.